2018 BRAND FASHION DESIGN - The fashion Aviator style is the popular top selling sunglasses women men on Amazon .Fashion and vintage polarized aviators sunglasses designer is suitable for men and women as high fashion accessory and daily wear. 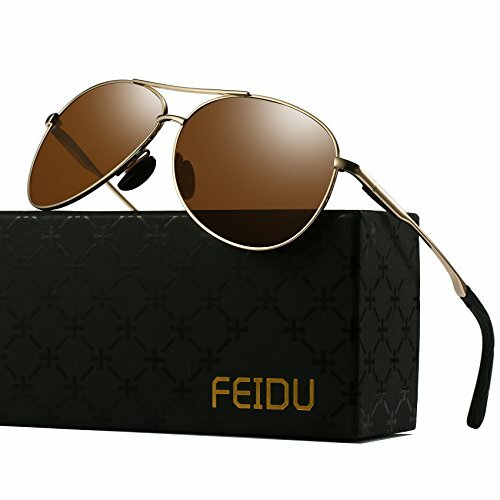 POLYCARBONATE POLARIZED LENS, HIGH QUALITY METAL FRAME - The FEIDU polarized sunglasses made with only the highest quality pilot alloy materials to ensure durability and avoid breakage while engaging in sports and outdoor recreational activity. EXQUISITE GLASSES CASE PACKAGE - The waterproof case and sturdy inner box can ensure the sunglasses' safety of transport. The screwdriver and polarizing card can help you know more about the sunglassses .The screwdriver can help you solve some small issue .